1. What is your favorite drugstore eyeshadow brand? e.l.f. definitely. Their smudge pots are some of my most loved and most used. 2. Favorite eyeshadow primer? So far it's been a sample I have of Too Faced's Shadow Insurance. That stuff has lasted me ages and it does the job. 3. 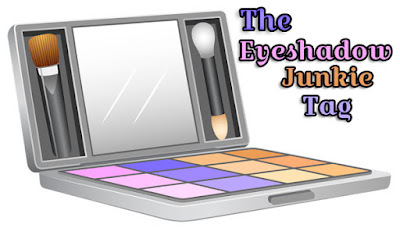 First ever eyeshadow purchase and do you still use it? I'm sure I had Bonne Belle eyeshadows and stuff when I was younger (does anyone remember those?) but my first proper eyeshadow purchase for myself was the NYX Runway Collection palette in Caviar & Bubbles. I definitely still use it, it's a perfect little neutral palette. 4. Best drugstore shadow dupe? Honestly, I can't really answer this because I don't really have high-end shadows to be honest. 5. Most under-rated and over-rated shadows? The most under-rated would be Coastal Scents shadow palettes. I don't hear a ton of people talk about them and I have a couple that are Holy Grail status for me. The most over-rated (please don't kill me, this is just my opinion) are probably the Makeup Geek shadows. I've only tried a couple and while I love their blushes, their eyeshadows never really impressed me. 6. Favorite single eyeshadow? If you know me you know I don't own many single eyeshadows, but the Colourpop ones are hands down one of the few I make an exception for. I especially love the shade Sequin, which I featured on a post here. 7. Favorite cream shadow? I love Lancome's cream shadow base in Noisette. I can wear it under other shadows as a sort of primer but I also wear it alone and it looks lovely for a minimal makeup look. 8. Favorite neutral shadow? Hard Candy does a palette called Natural Eyes, which is a knock off of theToo Faced palette of the same name. It has pretty much every neutral eyeshadow you could ever want and I use it often. 9. Favorite colored eyeshadows? I don't wear a ton of bright shadows, I usually leave that for lips, but e.l.f.s 104 piece palette has a ton of bold eyeshadow colors which are all super pigmented and buttery soft. I have used that palette time and again when I want to play with color. 10. Best eyeshadow palette ever? I mean, this is kind of like asking someone who their favorite kid is. If I had to pick, at this point I would say my Makeup Revolution Naked Chocolate Palette, I've used it pretty much daily since buying it. Haha this is the perfect tag for you Kim you do love your palettes! I need to buy some more I only have one at the moment. Great post gorgeous lady I hope you are having a great week! I must try Naked Chocolate Palette hon! This is a really great tag and I loved reading your answers, girlie. Always great to know what you've been loving ;) I look up to you in your knowledge of makeup!